I’m hyper-flexible. When I told one of my clients this, she responded, “Of course you are, Monica. You’re always willing to go with last-minute changes and work around stuff that comes up for me. Mommy, isn’t Monica hyper-flexible?” This cracked me up because what I actually meant was that my joints are hyper-mobile and so I can bend and stretch in ways most people can’t. However in life, when it comes to plans where I may be looking forward to something, I still have to practice flexibility. Especially with things outside of my control, like the weather. The beauty of practicing flexibility (because, Lord knows, I’m not a master of it) is that often I end up being surprised by the most magical, most touching experiences. Although I sometimes forget it, this truth is so consistent in my life that I should just expect it. How many of those did I complete? Zero. My dad was a magician and also created magic tricks for other magicians; I learned a lot about magic, growing up. Magicians play off of people’s expectations, kinda like life, where we see what we expect to see: if I expect beautiful, amazing, meaningful days, that’s what I will experience; if I expect someone to be judgmental, than I will hear what they say through that lens; if I expect someone to be compassionate, then when they say something that could be judgmental, I’ll give them the benefit of the doubt. The movie used people’s expectations to deliver a fun, engaging story. Megan and I haven’t been able to spend time together in about 2 months and so, while I was disappointed about not picking strawberries, my flexibility muscles only had to practice a little flexing, since I still got to connect and catch up with an old friend. We know each other from my days working at a local parish as a youth minister and I’m grateful that we still journey together even though I’ve now been gone from the parish for more years than I worked there. Megan was my secret squirrel partner-in-crime as I navigated between my theological training/beliefs and what my supervisor seemed to want. She supported me and we grew together. 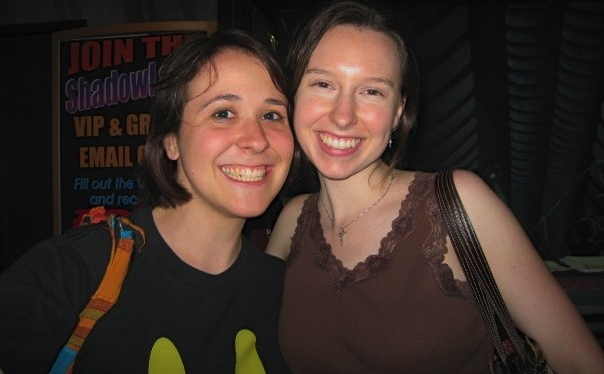 This pic of Megan and me is from one of the last things we did together at the parish where I used to work. It’s 4 years old! Pride Parade was another unexpected twist in my day: I’d thought about going earlier in the week, but hadn’t pursued contacting friends that I could attend with. This most likely meant not going, since I didn’t want to go by myself… Until 7 a.m. Saturday morning, when my mom called me and asked if I had found anyone for the parade. We worked out a play it by ear plan since my mom had work all day and I had plans that would go to the afternoon: she would go to her class then go to work, I would hang out with my friend for my 30 days of 30, then I would text her around 3 or 4 and check in to see if she was still up for going into D.C. Yesterday I did four things to celebrate my 30 Days of 30. I made sure to get lots of pictures, so I’ll let that be the focus. Writing: Every morning (mostly) I drink coffee and I sit for a while with what I’m going to post that day. Commitment to the 30 days of 30 posting provides me with a structure to write something additional to the varied writing I do throughout the day. As a writer, the discipline of daily writing matters immensely to me, and any way that I can create space for it is a bonus in my book. Reiki: I worked with a Reiki client today; it was my first hands-on client in several weeks. Amazing how quickly I forget what using that gift feels like and how strongly it feeds me to share it with others. I’ve practiced long-distance with several folks, but it had been some time since I worked with someone in person. Some day, I’ll write more about what the process actually is like, but for now, I just want to note that my favorite part of Reiki is walking with people as they step into their own power and gifts. Nothing beats that journeying-with. 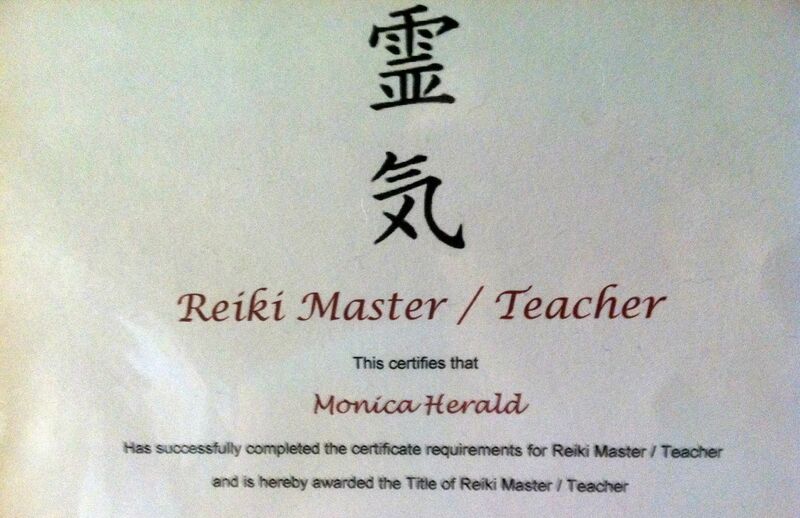 This was my final certificate in my Reiki classes. My teacher, Terri, is a gem, a gifted healer and teacher. 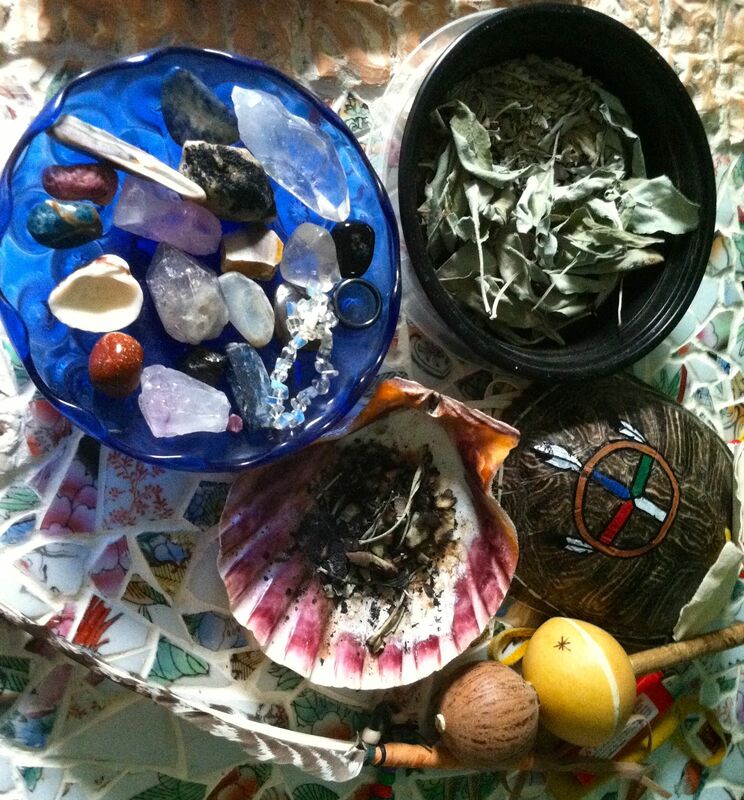 Some of my supplies: Stones and shells, Sage, Rattle, Feather.